This is mainly for any younger readers out there (although I hope all can get something from it). I believe YOLO (“You Only Live Once” for you old people) is still a saying. So… my question is – how are you living? Specifically, how are you living with regard to your future self. Since YOLO, are you living such that when you are on your death bed, you can look back and appreciate the present you? The idea of considering your future self is certainly not my concept. However, I DO have some questions. Will you be able to look back in 10, 15, 25, 50 years and tell yourself you did everything you could to set yourself up for what you wanted to become. Will you be able to say, “I’m successful” (however you might end up defining success) because of what I did now? Will you be able to tell yourself you did the best you could in your high school classes? You didn’t just quit because an assignment was hard? Will you be able to tell yourself you did the best you could in your high school extracurricular activities to ensure a potent job application / resume / college application? Or set yourself up for, and apply for, college scholarships? Will you be able to tell yourself you did the best you could in college or trade school? Will you be able to tell yourself you did the best you could in working your way up “the food chain” at work? Did the best you could at every task, every position, ever opportunity? Throughout your career? Will your future self appreciate the amount of time you spend on your cell phone or social media or watching TV or …? Are you setting him/her up to be comfortable? Are you helping to create a better society? Are you helping others in need such that you can look back and say, “I was a pretty good person”? The one person you will never be able to escape is you. You will, hopefully and if you are smart, move away from your parents. Brothers and sisters may move to other areas of the town, state, country. And if they don’t, you will still be able to avoid them. Friends and coworkers may come and go. Even your spouse will be avoidable on occasion. However, you are stuck with you. 365 days each year – 24 hours each day – 60 minutes each hour – 60 seconds each minute. You will be there. Even if you don’t look yourself in the mirror, you will still be there. You will live in the house you are setting yourself up for now. You will drive the car you are setting yourself up for now. You will eat the food and take the vacations you are setting yourself up for now. You will live in the comfort, or lack thereof, you are setting yourself up for now. You will live in the society you are helping to create now. Will you appreciate what you hear when you get the answer? Will you have done everything you could to set yourself up for success? However your future self will define success. Will you have done everything you could to set yourself up to have time for family and friends, leisure activities? Are you doing all you can to ensure your future self appreciates your current self and what you are doing for you!? Will you be happy, and specifically happy with yourself, due to what you are doing now? Is it time to change something about yourself? As with last entry, all hiliting and italics are mine. Comments in brackets  are also mine. I think the last paragraph, taken as a whole, very well explains the political oxymoron of the current socialist (read – Democrat) movement – as well as all such movements prior to it. People are completely capable of taking care of themselves – that is why we need government to do it for them – provide welfare, healthcare, Section VIII housing, etc. They have the intelligence and discernment to determine the best people to run the country – but we now have approximately ½ the population that can’t (won’t?) make enough money to pay the taxes used to run it, much less take care of themselves and their family. Hmmmmm. If you are as confused as I am, I am grateful to not be alone. “The law, then, is solely the organization of individual rights that existed before law. Man I wish I were that good. And he was only 49 years old! Maybe each and every Politian should read, and heed, his essay in its entirety. More than once. Oh, and maybe the Constitution of the United States along with it. More than once. Leonardo da Vinci once said, “Anyone who conducts an argument by appealing to authority is not using his intelligence; he is just using his memory.” While I will appeal below to a few “experts”, we will first appeal to logic, to rational thought, to critical thinking. Pride in appearance and speech begets pride in other aspects of your life. What you feel when you wear “dressy” clothes. The attitude you have. Some people claim they feel stifled when wearing a suit or nice dress. I’m not so sure that is truly the case. You undoubtedly feel less comfortable than you do in your favorite pair of sweats – especially since most aren’t used to wearing quality clothing on a regular basis in this day-in-age. On the other hand, there is a sense of quality. There is a sense of status if you will. You feel like people are going to have a higher opinion of you than is the case when you are wearing shorts and a t-shirt [and they DO by-the-way]. However you might feel in a pair of sweats – comfortable, relaxed… I’ll guarantee you don’t feel respected when you are out and about in flip-flops and shorts and a t-shirt. In fact, there may have been a time when you witnessed, either personally or someone else, someone “of quality” looking down with distain upon the manner of dress. You’ve seen all kind of writings about people who look down with derision upon those not acting properly, those who do not speak properly, those who do not dress properly. I believe that if we would be honest with ourselves we would admit that when we are “dressed up”, for lack of a better term, – at least what we would call it now days – it makes us feel good. It does make us feel there is a quality about us – a quality that is not there when we are in a shorts and t-shirt and flip-flops or sweats or pajamas on our way to Walmart. So keeping in mind those feelings, we should acknowledge our relationship with other people, how we treat other people, how we act toward other people, how we act with other people, is also of higher quality. It changes us for the better. As you will see below, this doesn’t necessarily work as well out there in the real world, the business world as an example, where people look with derision on those who just don’t take the time to put forth a good foot, either in the they dress or speak. It shows laziness, it shows sloth, it shows you just don’t care about the way you look, the way you speak, about the way you carry yourself. About the way you relate to other people. And, like it or not, business owners or those in the HR department or hiring managers for an organization, want to hire and keep people that aren’t lazy – people that present themselves in all manner of care. They want people that are going to take the time and make the effort to present themselves in a manner that is befitting the company – or people of quality period. When you do not present yourself in that manner you are losing out on opportunities you may otherwise have – opportunities for which you may have educated and trained yourself over many years. But more importantly, you are demonstrating to the rest of society that they are not worth the effort. Not that you are of less value. But that you are not worth the time. One type of example [and there are far too many to address in a single post] is the numerous studies done on dressing for work-at-home jobs (and elsewhere). All these studies conclude that how a person dresses affects work performance (even though nobody else can see you). The suggestion that having a home based business allows you to “go to work” in your pajamas or sweats is true. However, the studies show that your neighbor, being in the same business working from his home but dressing as if he were heading to an office in the city, would run rings around your productivity. Dress affects attitude. Dress affects alertness. Dress affects performance. Dress affects the bottom line. You don’t believe me? How about a few examples? • The business is not intended as a long term venture. Other examples… in these cases, effects of dress code on students. 19 Schools in Chicago did a study on student’s behavior by making one day a dress code day, one was a dress down day, and the other one was a regular day. There were 211 referrals given out on dress code days, 233 on regular days, and 322 on dress-down days. The study done in these 19 schools showed that by having a dress code it did decrease the bad behavior in school. (1) People never judge you by what you don’t say. They judge you by what you say, and if you can do this well, it will influence people to have confidence in you. Therefore, form the habit of pronouncing each word correctly, and to speak with care and dignity. (2) Speech is the only means to make yourself understood. By not pronouncing your words correctly and by not speaking with the proper care, your listener may get the wrong meaning out of what you say. (3) The correct pronunciation of each word, enunciating each syllable, will not only improve your speech, but will also enable you to spell correctly more easily. In Appropriate Language by Stacie Heaps: “One of the most important things you can do as an employee and colleague is to use appropriate language in the workplace. In the business world, making a good impression and projecting yourself as mature, intelligent, confident, and professional is critical to long-term success. Inappropriate language, whether spoken or written, can negatively affect your credibility and put off or even offend those you work with. Both in speech and in writing, take the time and make the effort to use appropriate language.” Her 8 rules for appropriate language begin with “Use standard English and follow established rules of grammar”. -Wear not your clothes foul, or ripped, or dusty, but see they be brushed once every day at least and take heed that you approach not to any uncleanness. -Think before you speak; pronounce not imperfectly, nor bring out your words too hastily, but orderly and distinctly. There is so much more but I promised my wife to keep my posts under 2000 words on Sunday – although I seem to be breaking that promise of late. All of this translates to our dress and speech being a factor in how we view and treat each other. We have “dumbed down” society through both. Since most have lost this sense of style, class, refinement – how might we get it back? We will look at possible solutions at a later date. Until then, what are you going to do?! I wish to discuss two things today – dress and speech. Two subjects, each having volumes of books devoted to them. I am going to concern myself primarily with our lower and middle class. For the most part, the upper class of society has kept up with tradition and it is of limited concern the minimal amount they may have “fallen”. And for any wishing to “run in those circles”, they will as well. This will of course set those of the “politically correct” persuasion on edge. I am singling out those “less fortunate”. Yet another nail in the coffin of the “99%”. It is not due to a dislike for them. I myself am a member of the middle class. However, it is what it is. And as the old saying goes, “what you are is your parents’ fault, if you stay that way it is your own.” As well, for those familiar with this blog you will realize I do not now, nor will I in the future, care. The politically correct have been, and continue to be, significant contributors to this problem so their thoughts on the subject are irrelevant. I have an “app” on my phone called BeSpeak. For those that do not have a wardrobe consultant (I do), it helps the “style impaired” with what clothing is best suited to them and how to dress properly. There is another called SnapDress. It allows one to actually take a picture of clothing to determine if it is appropriate for your “profile”. The 21st Century does have some amazing technology (if used appropriately). However, technology or not, many just don’t care. They do the minimum necessary to fit into the minimum, current dress for which their “industry” calls. There is no doubt in my mind that the current state of dress and speech are not only demonstrative of the degradation of our society and culture as a whole, but contributed to their downfall. I spoke before about civility in cyberspace. This, of course, is only a small piece of the overall issue. Civility in general is lacking. Call it how you want – it is virtually lost in society as whole. How we treat each other – opening doors for females, thank you notes, RSVP, saying please. Our music, our television shows, our movies. Our dress in public (even in private…). What little civility exists is quite limited these days and is primarily found in the upper echelons of the financially well off. From the time of the Renaissance to mid-20th Century the world operated in a more formal and dignified manner. The elegance and grace with which they conducted themselves was astonishing. While everything was certainly not perfect, they, for the most part, represented themselves in dress and speech in a civilized way in their everyday lives. This translated to a cultured and urbane society at every level. As an example – Downton Abbey. My wife has gotten me hooked on this television show about a late 19th Century – early 20th Century English earl (the Earl of Grantham), his family (the Crawley family) and the servants that work for them. I am really not that excited about the actual story. It is interesting to an extent but I am far more interested in the portrayal of the times and methods of interaction – the clothing, language and manner of speaking with and treating each other. While they are certainly not always “nice” to each other, they are formal, even polite, and proper in their relations and dress. It is a dignified and refined manner of interaction and presentation. And this is not limited to the “upstairs”. It is not limited to the earl’s family and his circle of friends. The “downstairs” staff also functions in this manner. They address each other at all times in a formal manner. Mr. Carson (the butler), Mr. Bates (Lord Grantham’s valet), Mrs. Hughes (the head housekeeper), Mrs. Patmore (the head cook). You have to be as “lowly” as a mere footman or scullery maid (pretty much the bottom of the chain and quite young anyway) to be addressed by your first name. But at the time you are promoted to a higher level, you immediately are referred to in the formal manner. In the U.S. we came to be somewhat less formal even before that timeframe. But the extent of that limited informality came in such situations as the Southern Plantations (or cities for that matter) where females were still addressed as “Miss” and first name (even those married) while men were still always addressed as “Mister” and last name or just plain “Sir”. Within families or with very close, longtime friends (and normally in more private affairs) these rules were usually relaxed. In additional to how they address each other and the formal manner in which they speak, is the way the dress. Regardless of your position, you dressed “properly”. Even the “lowly” footman wore white tie and tails to serve dinner and what we would consider black tie at other times on duty. When they are not on duty they still were appropriate slacks and “sport” coats or more casual suits. When the men went hunting it was in suit and tie (casual, but a suit none the less). When outside they virtually always wore a formal hat (vice baseball cap). When on a picnic the women wore dresses. Not a formal gown of course. That was reserved for the evening meal or other such formal occasion (where the men wore white tie with double-cuff sleeves (aka – French Cuff)). During one episode one of the female relatives (Isobel Crawley) showed up at the manor in quite appropriate daytime dress to speak with the family. When invited to dinner she politely refused because she was not wearing proper dinner attire (although what she WAS wearing was far nicer than what people these days wear to an evening out). While many may suggest that this is the household of a noble and so appearances must be kept up, scenes from elsewhere in the show prove otherwise. Scenes from the town showed that EVERYBODY dressed and acted as formally as their station in life would allow. Shopkeepers wore suits. Even mechanics working on machinery wore suits. Gentlemen farmers and their farmhands wore suits. Females were always in dresses. 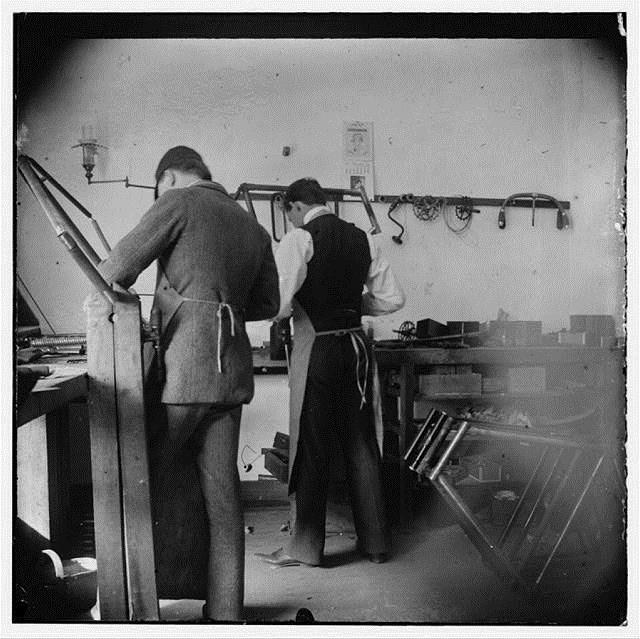 I cross “the pond” to the US and look at old time photos of the Wright brothers in their bicycle shop (lest you believe this is just on TV – see original photo below), men panhandling for gold in rivers, ladies of all walks and stations of life. They ALL were in suits and ties or long dresses often with lace. East Coast or West, North or South. “White Collar” or “Blue Collar”… People cared about their appearance. People cared about how they presented themselves to others and it made for a far more well-mannered, gracious, respectful society. And now we are in the present… I’ve actually seen people in upscale hotel (not motel) lobbies, stores, parks and other place of public dressed in pajamas. People wear sweats and “flip flops” out to a sit down restaurant – sometimes formal (fast food restaurants are bad enough). Places that used to have dress codes (including a rack of jackets and ties for the gentlemen that “forgot” to wear his) now have people in jeans and t-shirts. Grown men at church in shorts, a t-shirt and athletic shoes (or even flip flops again). Boys out in public or going to school with pants hanging off their derrière, underwear showing and continually having to pull them up so they can walk without tripping. Other than just looking ridiculous, it has got to be problematic. Why would one add to the problems they already face? Girls think it absurd as well by the way. While I will not go so far as to advocate the complete formality of the past, I certainly would be ok with not even considering going outside without a casual suit or sport coat (and maybe even tie). Concerning speech… I am led to understand, by actual high school English teachers, that what has been considered “informal speech” in the past is now acceptable in virtually any manner of our lives. Miss Manners be damned. While we have always had “formal” and “informal” (slang?) grammar, “acceptable” grammar at all levels has been reduced to the lowest common denominator. Using a preposition to end a sentence with? No problem. Using “can” in place of “may” (can I go to the restroom)? That’s fine. Listing a group of names with that of the speaker first? Perfectly acceptable. It is just an informal way of speaking and we are to accept it in polite society. Why teach correct English when we can just modify the standards to what the average 3th grade student of the past used. “Can I go to the restroom?” from a High School student. How ridiculous. And their English teachers allow it! What they fail to realize is in fact polite society does NOT accept it. You will be looked down upon and treated with distain. And then wonder why you can’t advance your station in life. We are leading our lower and middle class children into believing they can work their way up the corporate and societal ladder without regard to how polite society speaks and acts. They are being held back without even knowing it. Then they blame “the man” for “keeping them down”. It is not the man. It is their own acceptance of what our society, at its lower levels, now accepts as the norm and teaches (or at very least, accepts) in its schools. As an aside – don’t get me wrong. Our schools are doing much better than that for which many give them credit. In some regards though we are not having our students live up to a high enough standard. We are accepting lowered societal standards. We are dumbing down society. More on schools in a future post. This leads to a situation today where the crudeness of, the vulgarity in, our speech is beyond the pale. It is inexcusable and indefensible. Mainstream songs, movies, even television shows demonstrate crassness never before imagined – often in the name of free speech. I am in no way desiring to limit free speech by law (except in obvious case of libel, slander, danger (yelling fire in a crowded theater), and such situations). However, it is a mark of polite society to limit our OWN speech. We shouldn’t have be have laws or policies against it. It should be taught and observed from the youngest age that it is just not done. What strikes me most is how we’ve lost this. “Things change” we are told. “Keep up with the times” we are told. That would be great if the times were improving. I would submit in many respects our times ARE improving. Our technology is making the world “smaller” via communication and transportation improvements. It is improving medical care and therefore our quality (and length) of life in many respects. However, I defy anyone to demonstrate how changing to a more informal (for lack of a better word) society in dress and speech is making our culture – our society – a better place in which to live. We are losing all respect for ourselves and our fellow man. Now of course you may say, “What has this got to do with us?” We like the more informal way of life. It works for us and we are hurting nobody through it. With which I would disagree. Your being ok with, and supporting, ill-mannered, gracious less, disrespectful society affects the rest of us. We will discuss this next time.